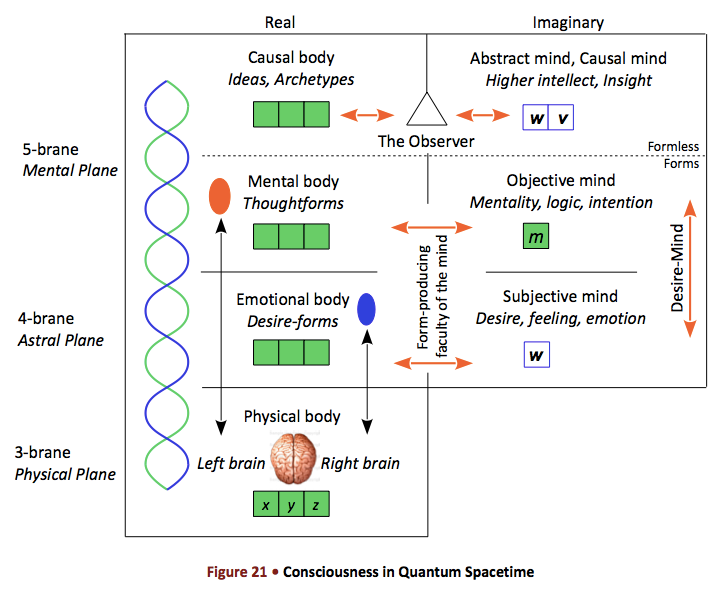 The journal NeuroQuantology recently published an invited paper by Philip Carter titled Consciousness and Perception in Higher-Dimensional Quantum Space-time1 which, I believe, is a particularly significant work, fostering an approach to a worldview compatible with and complimentary to a noetic triune worldview. Indeed you will as Carter ‘s framework for consciousness includes two imaginary planes, inner dimensions added to the classical three dimensions of physical, outer space. The paper is no simple read in the park. Those who go beyond this simplistic, abbreviated description are in for some tough slogging. They must be prepared to engage with such challenging physics constructs as: Minkowski spacetime (Figure 27); the gravitational wavefunction; 3-, 4-, and 5-branes; the Transactional Interpretation (TI) of quantum mechanics; and offering and confirming standing waves. Dare I also mention such esoteric notions as: the identity of space and consciousness; objective and subjective space; emotional energy and relative motion in imaginary (i) space; and the ensuing physics of perception–just to name a few others. Does a photon experience time? Well, to find out you’ll just have to read Quantum Spacetime and Consciousness. It will be well worth the effort to engage with Carter’s fresh thinking. I hope you will appreciate the enlightenment of a promising integral worldview of physics and consciousness, one that joins inner and outer, real and imaginary space and, possibly, provides further insights into the physics of a noetic triune. 1. Available as Quantum Spacetime and Consciousness on the free e-prints alternative archive, viXra.org. This entry was posted in Nonlocality, Worldviews on April 4, 2014 by Tom Nielsen, EdD.